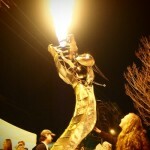 The FLUXcycles are mobile fire sculptures built by FLUX Foundation artists. 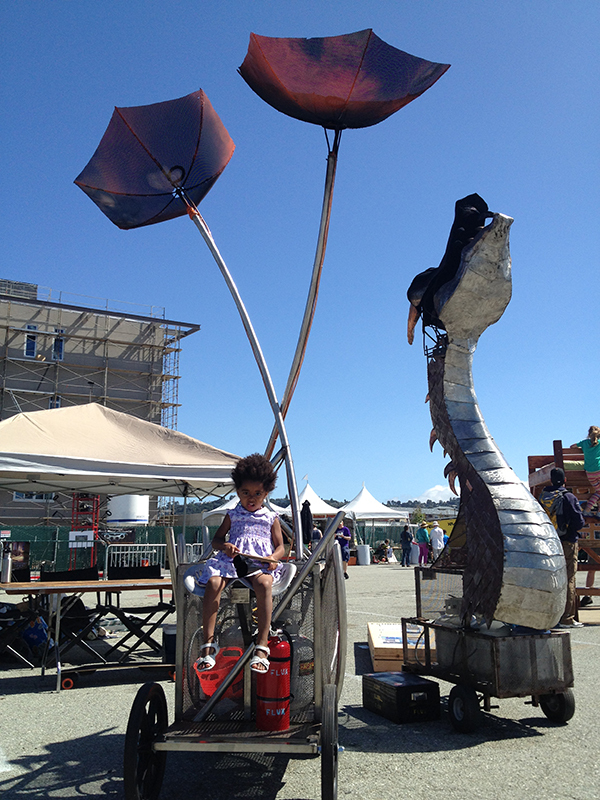 These low-cost, high-impact sculptures have a simple design: a light-weight metal sculpture with an interactive flame effect on wheels. 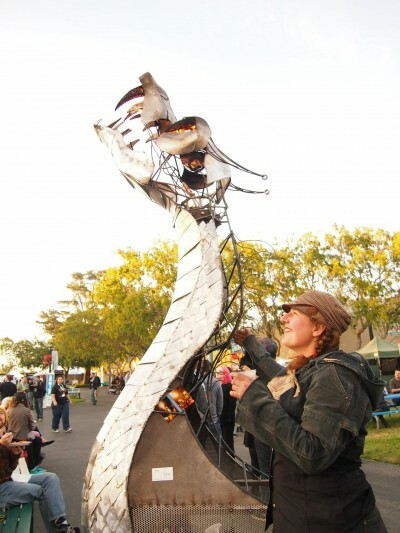 They wow crowds wherever they go and are favorites at events like Art Murmur in Oakland, Maker Faire and the Brewery Art Walk in Los Angeles. These pieces are available for events. Contact us if you’d like to learn more. 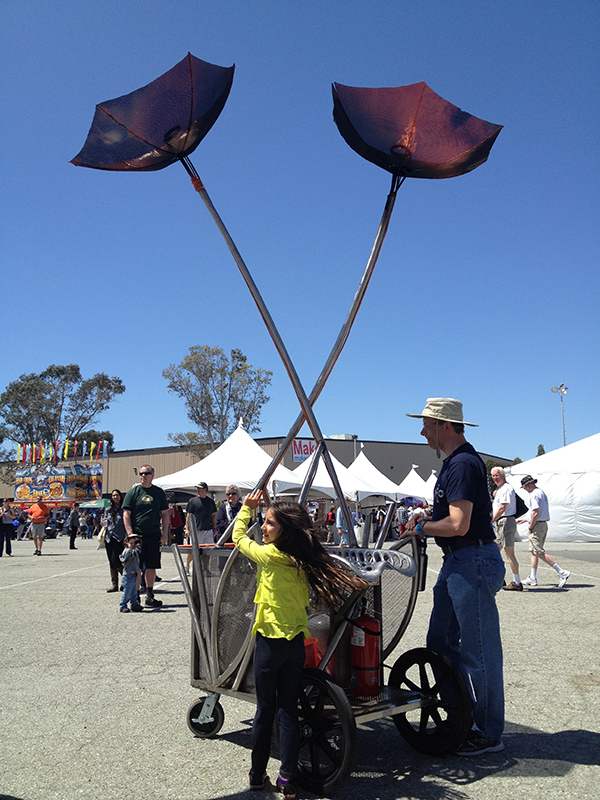 A re-imagining of our 2011 piece, BrollyFlock, PoppyWagon is a whimsical fire sculpture on wheels. 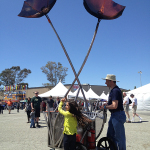 Made for the 2014 Maker Faire in San Mateo, its bright orange buds inspired by the California Poppy burst with flame that you control with the push of a lever. 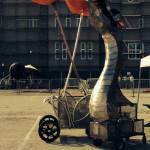 The wagon is a custom-made cart designed an fabricated by FLUX artists. It even has a bucket seat in the front where a participant can sit and enjoy the ride as the wagon is pushed along. Our lil’ dragon may not be the biggest dragon out there, but it might be the most loved. 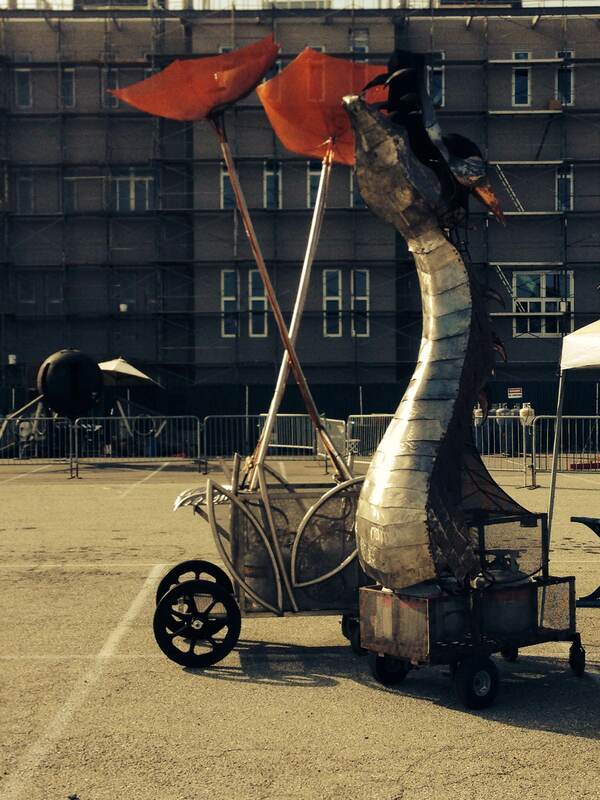 Made with rolled rod, stainless steel, copper, aluminum sheet and mild steel, the dragon’s pose is from the neck up. It breathes fire, with pulsing ambient flame and a poofer that bursts from its mouth. Inspired by the Chinese Year of the Dragon, FLUX artists Cheryl Fralick, Margaret Long and Heather collaborated together to make this fierce little dragon. These artists are proud to offer it up as an example of collaboration and are eager to use it to entice other people to get it their heads to make something. 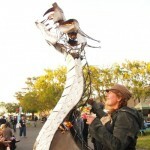 The Dragon Wagon has been shown at Oakland’s Art Murmur, Maker Faire, the Brewery Art Walk in Los Angeles and San Francisco’s Public Works event space. 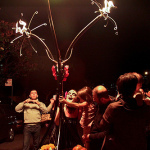 The FLUXcicleta debuted in November 2011, first at the Dia de Los Muertos parade in San Francisco and then at Art Murmur in Downtown Oakland. 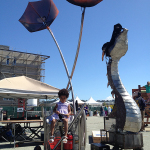 Created by FLUX artists, Catie Magee and Matt Mynttinen, the sculpture was developed as something that could be transportable and fun. 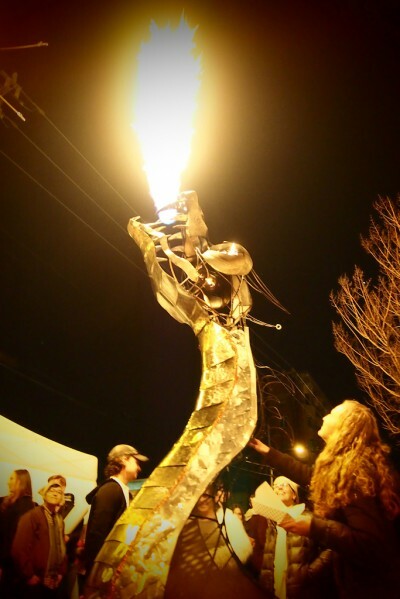 They set out to create a mobile piece with a simple yet exciting interactive flame effect. 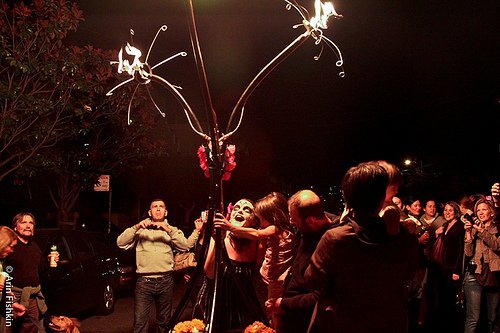 The FLUXicleta’s three metal branches extend about 8’ – 12’ in height from a wooden trailer and culminate in metal flowers with subtle propane flame effects. The tallest branch has a poofer activated by a manual brass valve. The piece is pulled by a bicycle and is an entirely self-contained within the trailer. The FLUXicleta pulls people in with its exciting interactivity and sparks conversation about FLUX and our collaborative art, inspiring people to come to the shop to get involved. Posted on Saturday, August 25th, 2012 at 5:54 am. Filed under: Portfolio Tags: featured	RSS 2.0 feed.